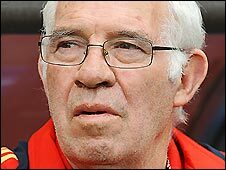 Spain head coach Luis Aragones has denied claims that he has agreed a provisional two-year contract with Turkish side Fenerbahce. Fenerbahce made an announcement earlier on Wednesday declaring that the current Spain coach would be taking over coaching duties after Euro 2008. "I don't understand it because Luis hasn't signed anything with anyone," said the 70-year-old. Aragones also denied he had been offered an extension to stay by Spain. Brazilian Zico left his post as coach of Fenerbahce on 10 June after failing to agree a new contract. Aragones, who won 11 caps for Spain as a player, has been in charge of the national side since 2004, and has had previous spells as a manager with the likes of Barcelona, Atletico Madrid, Sevilla, Valencia and Mallorca.